"You see," she began, and turned her body to face him. "Everyone must know what happened. Your story must be real, as only you can tell it, not just what you have seen with your eyes and heard with your ears but what you have felt. Your voice must be a clarion. Because the truth is far beyond journalism's grasp." "The day was hot and dry like a extra thick towel you get at a good hotel, The Crillon or The Vendome in Paris. They heat the towels for you there. When it is cold outside, when the day is the color of nickel, when the birds ne chantent plus. She read Beaudelaire. Comforts were not lost on her. Her father used to lock her in a cold cellar at night when she was nine for forgetting to feed the dog. She carried the cold in her bones." "She smelled of cardamom and linseed. Around her neck she wore a strand of Persian turquoise he'd brought from the States and hid in his pocket while traveling through Rwanda. If Hutus had seen it, they would have seized it. Very good turquoise, he had told Maria, no visible veins." "He woke at dawn and watched them sleep. He felt connected to Maria and Noel, the way the heart is connected to the lungs, the way the skin is an umbrella organ for systems of great magnitude. He remembered the market smells, his first time in this small country, right in the heart of Africa, practically sitting on the equator. The smell of mildew, of charcoal-burned meat, of old sweat, tobacco and fruit rind. He remembered the terra cotta hills looming large from where he'd stood, the rooftops of palm and thatch. He remembered the piercing Rasta music. Now he had a daughter. He felt propelled like a chord sprung from a steel guitar." "If I were the devil and I really wanted to punish you, I would give you great success in something you didn't believe in." In a red chemise, facing him, she added, "But then you don't believe in the devil, do you?" "Women!" he bellowed. "Proud of this metaphysical power they assume they possess. Power to change a man! Talk about ego! Women need to know men don't change! -- And babe, I do believe in the devil! Look at my ex-wife and a few of the women I dated! They might as well cleave with goats!" "Gelmi considers herself a pacifist, but these poems read as if she's got her finger on the pin of a grenade.This is sobering verse of the highest calliber." "I read Gelmi and see the influence of Gerard Manley Hopkins and Gabiele D'Annuncio,--and Dylan! She is heady, and snazy and this mix provides a surprise a second." Rub two words together; if they generate heat you’ve found poetry. Alessandra Gelmi has bundled together enough poetry to create a Ring of Fire in her new collection. Gelmi, an accomplished journalist, author and playwright, leads us on a journey of self discovery searing the soul with each turn of the page. The collection, written during the period 1972 - 2006, leaves you wanting more or at the very least wanting to be reassured more will follow. Like an evening of speed dating with your inner life, Gelmi creates a compendium of spirits, all with the character to reveal the truth. As an experienced guide and seeker she is unafraid to peel back the layers to discover what lies beneath. Her heartbreaking poem, At the Zoo is a meditation on the desire to retrieve what was lost. At first read it seems a pitiable sight, this poor caged animal trying to recover his former self. But upon reflection one has to wonder: does he sharpen his horn when no one is watching? Does he truly believe he can restore his horn or simply need his audience to believe it’s only a temporary condition? Where does the performance end and life begin and when did we lose the ability to know the difference? As we exist in our restrictions why do we need to keep up appearances when others are watching knowing full well we gave up long ago? The questions are unanswerable and the answers indefinable. Art leads us to true reflection, but art is not a mirror. A mirror is a barrier; we can only touch the barrier not the image itself. When art enters the bloodstream it reconfigures our emotional metabolism resulting in a low grade fever. The challenge is to hold on to the fever, resist the urge to sweat it out; for at those moments the warmth brings the awareness; you are still alive. Ring of Fire is a meditation on the human experience that you will need to visit again and again. Gelmi’s words stare back at you unflinching in their emotional honesty daring you to turn the page and dig deeper. The dig is well worth the effort as the journey is enlightening and rewarding. Find a place of solitude when you visit the Ring of Fire. Read Ring of Fire, set it down, reflect, then repeat. Then find the courage to take pen to paper, or if you wish, fingertip to key and generate some warmth of your own. Book Review: "Ring of Fire"
Alessandra Gelmi is an intelligent writer; she is also a writer with heart. Her collection of poetry written from 1972 through 2008, Ring of Fire, is, in a sense, a chronicle of suffering and the many different forms it can take, sometimes a result of the innate brutality of life and sometimes of our own doing. Gelmi writes as a Christian and a seeker of grace and says: If you want to share in God’s glory, you must share in God’s pain. Her collection of poetry speaks to the idea that “to reach the epicenter of His [God’s] heart, that core of peace, there is no shirking that exquisitely painful Ring of Fire.” And with the cast of characters that appear throughout the collection, we face the fire head on. this! are you following me? Although she mostly writes in free verse and sometimes exhibits an easy, jazzy style, the poetry in this collection tends to reflect Gelmi’s classical training and educational pedigree. According to her biography, she holds a bachelor’s degree in English from Barnard College, Columbia University and both a master’s degree and a fellowship from Boston University where she taught under the aegis of three Nobel laureates. As a former member of The White House Correspondent’s Association and a writer for magazines and national daily newspapers, she is equally at home with local vignettes and poetry involving genocide and larger global events. Campesinos, for example, reads like a dirge to lives lost in El Salvador. 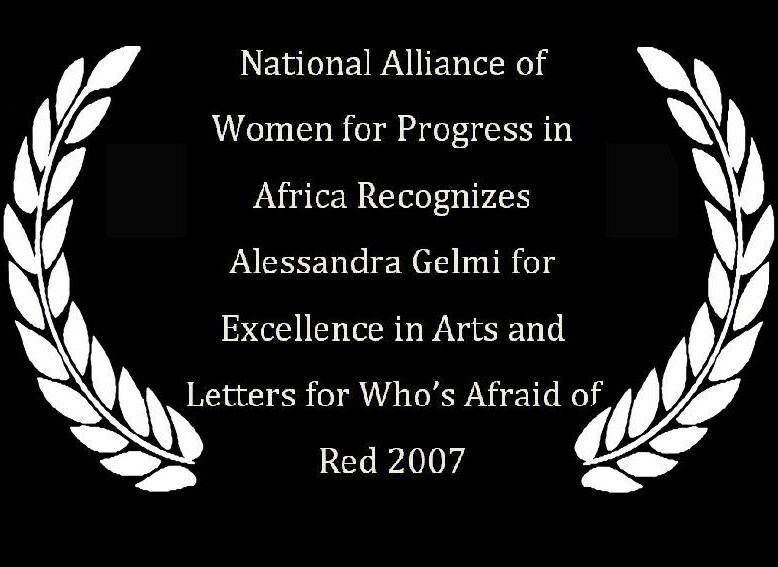 Her first book was Who’s Afraid of Red, a novel in three parts revolving around the tragic events that occurred in Rwanda in 1994. James Dickey, the distinguished American poet, once called Gelmi’s writing “powerful.” I would agree. Gelmi’s power lies in her willingness to look pain, loss, and folly in the eye and not blink. She sees it all, she accepts, and so do we. And therein lies a certain peace.